The havoc unleashed by the recent floods in Kerala has shocked people across the country. 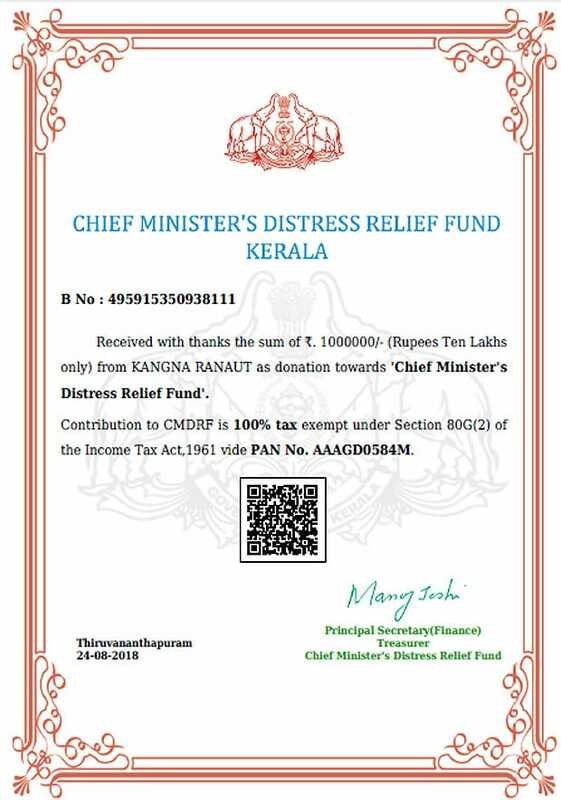 Kangana Ranaut, who was also moved seeing the visuals coming from the God’s Own Country, as the state is called, decided to do her bit for those affected and discussed it with her father. However, since the actress was shooting night shifts, she had been unable to sit down and contribute to the cause. After a couple of days, when she came to know that her father had made a donation, she, too, decided to make her contribution immediately. 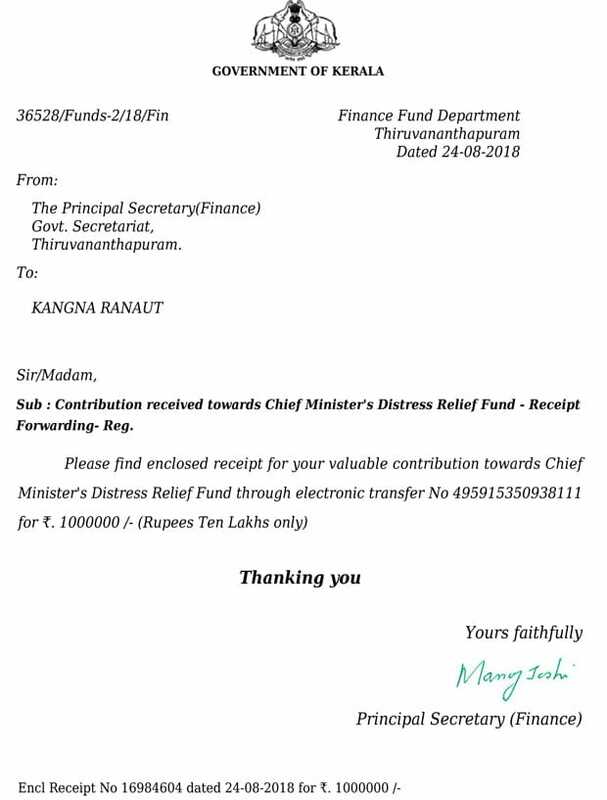 Says our source, “Kangana did the transaction online, donating Rs 10 lakh for the CM Relief Fund for Kerala Floods.” The government presented Kangana with letter of appreciation and a receipt to her grand gesture. Find it below. “I want to urge to people of this country that in whichever capacity they can, they should contribute, even a small amount will make a difference to Kerala,” says the actress, adding, “To my people there, I want to say, the whole nation is praying for them and supports them. We feel their pain and sense of loss. And by the grace of God, they will be soon back to their glory.Vandey Mataram! On professional front she is currently shooting for Manikarnika which is a biopic on the Queen Of Jhansi, Mental Hai Kya with Rajkummar Rao and Ashwiny Iyer Tiwari’s Panga.